kymoto 12cc Four Speed Deluxe Full Motorcycle - Best Price & FREE SHIPPING! Hydraulic Disc Brakes, Electric Start, Lowest Price - / FREE Lock, FREE Gloves & FREE Helmet with Purchase_$286-Value all FREE! Designed to be the ideal everyday transportation motorcycle. 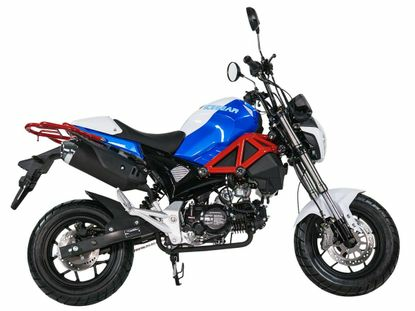 The Little Monster 125 is built for a quick commute to work or school. Having a compact and responsive design this 125 GY-6 Honda Clone engine makes it one of a kind. Responsive, great power curve, front and rear disc brakes, and a sleek modern design make this powerful 4-speed motorcycle a great buy. The 125cc GY-6 engine delivers plenty low and mid-range torque coupled with the 4-Speed Manual Transmission makes this a very spirited bike as well as being a smooth and comfortable ride. The advanced chassis and upgraded suspension provide sporty and nimble handling. Perfect for commuting around town, getting to school or work, riding the Little Monser is your ticket to fun and savings. Comfort and convenience are prioritized so that all you have to do is enjoy the ride. Adventure comes easy with all-day comfort with the smooth shifting 4-Speed Manual Transmission. PURCHASE! a $286-value all FREE on most models and FREE SHIPPING with any Scooter Purchase!! !